Directory services have traditionally been on-prem implementations. In fact, many IT organizations are skeptical that a completely cloud-based identity provider (IdP) is even possible. 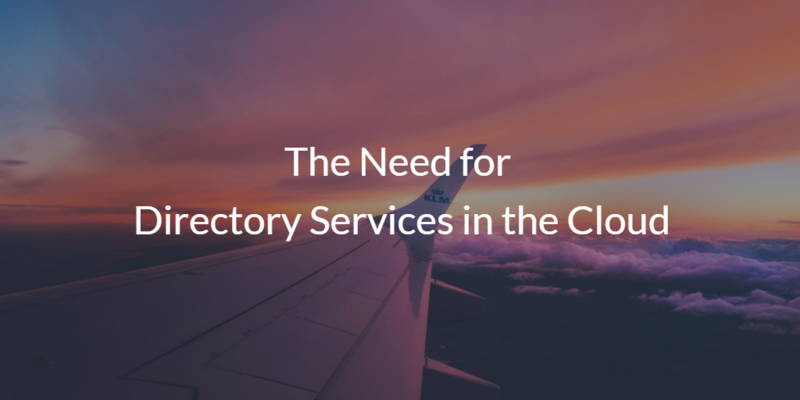 However, as core IT solutions shift to the cloud, more IT admins are recognizing the need for directory services in the cloud. We’ll discuss some of the advantages of a comprehensive cloud-based directory services platform in this blog post. But first, we should talk about why so many IT organizations are leaving traditional directory services platforms behind. Directory services refer to the software and hardware that enables IT to securely manage and connect users to IT resources such as systems, applications, files, and networks. 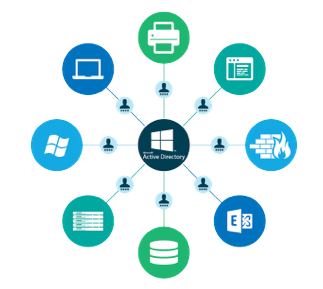 Over the past two decades, Microsoft® Active Directory® (AD) has been the on-prem directory services platform of choice in most IT organizations. Microsoft introduced AD in 1999 to help IT administer Windows® users and their access to on-prem networks. 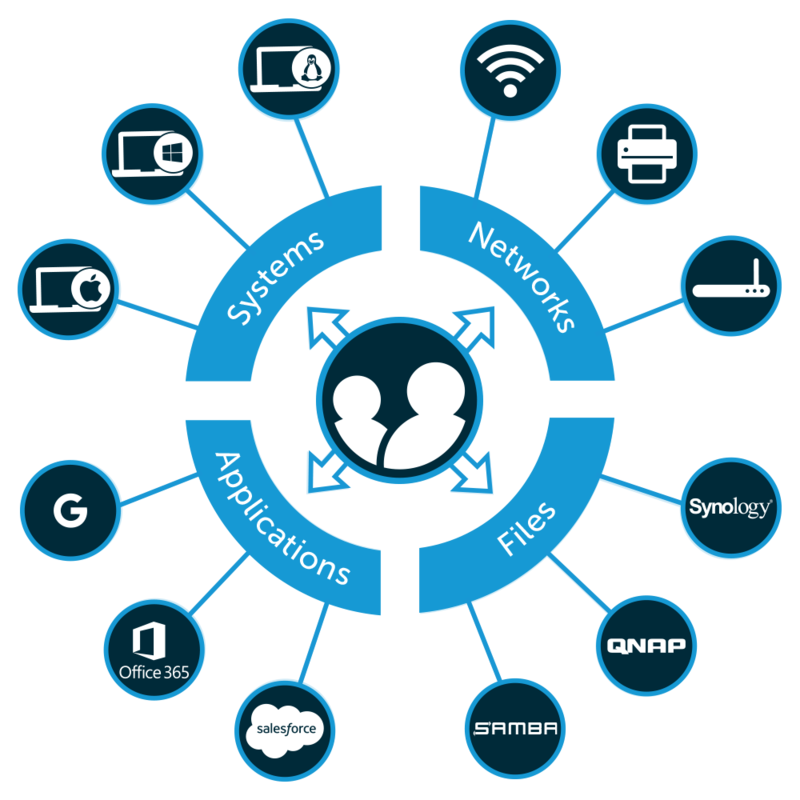 Considering that the network was mainly comprised of Windows-based IT resources, IT admins generally integrated AD into their environments and never looked back because they could effectively manage their entire infrastructure with one identity management solution. However, like all things in the IT market, the landscape changes and requires adjustment. 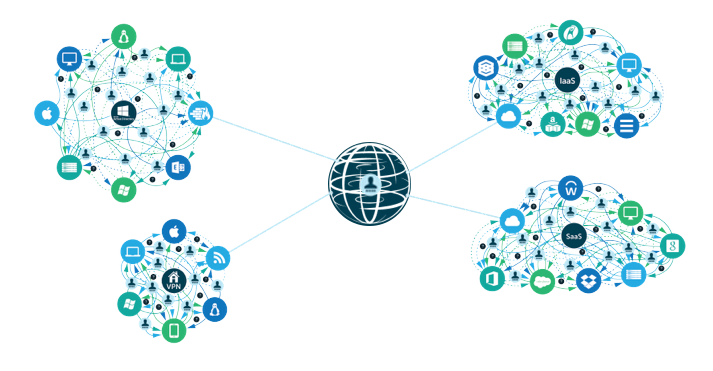 Today’s IT infrastructure is vastly different than the Windows-only networks of yesteryear. For example, Mac® and Linux® machines are more popular than ever; on-prem data centers are being replaced by Infrastructure-as-a-Service (IaaS) providers such as AWS® and Google Cloud Platform™ (GCP); web applications like G Suite™ and Office 365™ exist for just about anything; file servers are now more cost-effective with on-prem options like Samba file servers and NAS appliances, or cloud alternatives such as Google Drive™, Box™, and Dropbox™; even the network itself is no longer a wired connection, but rather wireless. All of these changes and more have placed enormous pressure on the legacy IdP, Active Directory. This is primarily because AD was never designed to support non-Windows IT resources – regardless of whether they were on-prem or remote. Beyond the fact that an entire generation of IT resources doesn’t connect well with AD, modern IT admins are also shifting their entire on-prem identity management infrastructure to the cloud. Of course, as previously noted, there has been some skepticism about the efficacy of this approach – but new innovations in security, scaling, and protocols are encouraging signs for IT organizations. As it relates to directory services, a next generation cloud identity management platform is changing the IAM landscape. This modern approach to the cloud directory is cross-platform, mixed protocol, multi-provider, and location agnostic. In addition, as a SaaS-based solution, this approach reduces the overhead and management that IT organizations have with their on-prem counterparts. The JumpCloud® Directory-as-a-Service® platform is the embodiment of this new approach and meets the need for directory services in the cloud. JumpCloud Directory-as-a-Service is the first holistic directory service in the cloud that securely manages and connects users to their systems, applications, files, and networks. We say holistic because the JumpCloud platform works regardless of the platform, provider, protocol, or location of your IT resources, rather than being limited to on-prem networks of Windows-based IT resources. Whether that be on-prem or remote systems running Windows or macOS®, Linux servers at AWS or GCP, web and on-prem applications leveraging SAML and LDAP, on-prem Samba file servers and NAS appliances, cloud storage at Google Drive or Box, or even wired and wireless networks – JumpCloud has you covered. Do you think your organization has the need for directory services in the cloud? Sign up for a free account today and discover how JumpCloud can optimize your modern IT environment. We offer 10 free users to help you explore the full functionality of our platform at no cost. Of course, you can also contact the JumpCloud team or schedule a demo to answer any questions.